Cross-culture mobile romance is about to get easier. The English language version of Momo, a flirting app that has been taking China by storm this year, has arrived on Apple’s App Store. The app lets users chat (and, therefore, flirt) with strangers located nearby and has gotten quite the reputation as a hookup tool. If you’re interested in learning more about it, read about my first experiences with the service in TNW’s recent profile on the modern dating scene in China. 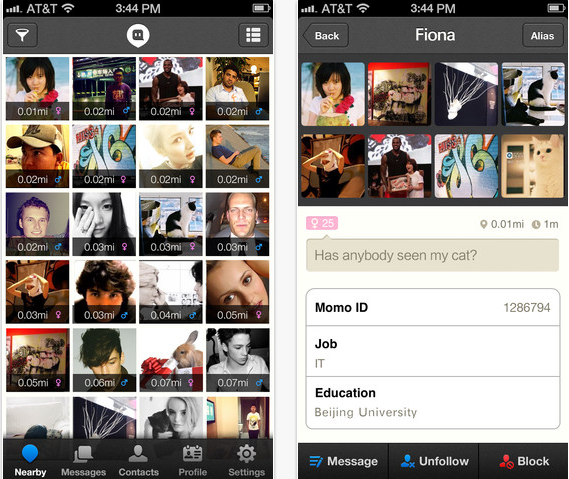 Momo boasts 16 million users, an impressive leap for the app, which hit the scene last year. In August, the app celebrated its first birthday by passing the 10 million user milestone with 2.2 million active users, and it hit the 16 million mark just two months later. One interesting addition to the English version of Momo is Facebook connectivity. Facebook is blocked in China, so the integration is clearly designed for overseas users. Critical mass is going to be an issue for the service as it goes international, though. Since it is location-based, users living in cities with low adoption will be unlikely to keep using the service, which of course will prevent further adoption from others. The company has, however, seen some adoption overseas already. Momo’s operations manager Li Dihao told Tech in Asia last week that roughly 10 percent of its users are international. Given that the app is Chinese-only at the moment, a number of those flirters are likely to be overseas Chinese speakers. The fact that Hong Kong and Taiwan are some of its strongest markets outside the mainland suggests as much. However, Li believes the number of international users will “skyrocket” once the English version arrives. Rumors suggested this summer that Momo had raised a whopping $40 million in series B funding. Company executives declined to discuss the subject when I visited their office last week, but they did note that Momo was valued at $100 million.